This has been prepared by scholars as correct information for students inquiring about more “free” accurate information regarding this national figure who played such a prominent role in the early exploration of the west, traveling farther than any previous searcher. It is copyrighted but free for use and recopy by any student or serious scholar who wishes to use it. As the Europeans left their homelands to seek a new life across the Atlantic Ocean, they faced many hardships in the unexplored lands in America. Generations of new settlers stayed in the coastal areas in the East and did not venture into the unknown lands to the west that were controlled by the Native American Indians. Those who traveled first into these areas became heroes in their own time and earned a place in history. These were men such as Daniel Boone, Lewis and Clark, Jim Bridger, and Kit Carson. An overlooked, but very important early explorer was our Jedediah Strong Smith who at the early age of 32 was killed before he was able to publish his journals and maps. Therefore his story remains in the shadows of history. Born in Jericho, New York (which has now been renamed Bainbridge) on January 6, 1799, Jed Smith had grown up hunting and trapping in the forests of New York, Pennsylvania, and Ohio. He had also learned to read and write, skills that not all had mastered on the American frontier. Aside from his Bible, which he usually carried wherever he went, Jed had also read about the Lewis and Clark Expedition. He dreamed about blazing new trails and exploring the unmapped lands in the West. In 1822, Jed’s dreams became reality thanks to a newspaper advertisement from St. Louis. William Ashley was hiring one hundred men to go up the Missouri River to trap beaver in the new territory. Jed set out for St. Louise, realized this was an opportunity he couldn’t pass by which would not only fulfill his desires to explore, but also produce a good income he could share with his struggling family in Ohio. Experienced in frontier skills, this 6 foot-3 inch, powerfully built twenty-three year old was just what Ashley needed. He hired Jed on the spot to be a hunter for his party. On the morning of May 8, 1822, Jed and the rest of the men loaded supplies on the keelboat, named the Enterprise and started their journey up the Missouri River. Three hundred miles up the river, the boat sank, and the men had to wait several weeks for another boat to arrive before they could continue their trip. The boat was pulled upstream against the current by a long rope called a “cordelle”. The men walked on the bank, waded along the shore, all the time dragging the boat. Sometimes oars or poles could also be used to move the boat along. Or if the wind was strong enough, a sail could be raised that would help provide power. It was hard work, and the progress was slow. The only advantage was that they did not have to fight with Indians as the tribes along the river let them pass without interference, in peace. Because of his skill as a hunter, Jed spent most of his time ashore bringing fresh meat to the camp to feed the hungry men. It was October when they finally arrived at their small fort on the Yellowstone River above the Missouri. Ashley separated the men into small groups to trap the valuable beaver pelts. He then returned to St. Louis for more supplies. Jed’s party went farther up the Missouri River; and set up camp on the Musselshell River (in today’s Montana). During this first winter in the Rockies, the need for additional horses arose after several of their scattered trapping parties were attacked by unfriendly Blackfoot Indians. In June, Jed was sent downriver to find Ashley and tell him about the missing horses. He met Ashley near the Arikara Indian village, which was a fortunate meeting place to acquire horses, but due to recent hostilities of this tribe, Ashley and his men had to take special precautions. These Indians had extra horses and were willing to trade. Jed and a few men spent the night on the riverbank to keep a close watch on the newly purchased horses. However, just before dawn the Indians began shooting at the trappers from inside the walled village. Soon the only cover Jed and the men had, were their dead horses. To escape this dangerous situation Jed and the men dove into the river and swam to safety. In the battle, twelve men had been killed and ten were wounded. When Ashley asked for a volunteer to go to the fort on the Yellowstone for help, Jed went and soon returned with reinforcements. While he was gone, Ashley had rounded up a party of Sioux warriors and a U.S. Army troop. Together, they formed a force large enough to defeat the Arikaras. The Indians agreed to repay Ashley for the horses and supplies the trappers had lost. Instead, during the night the Indians left their village and escaped without paying anything. Before Ashley returned to St. Louis to obtain more supplies, he appointed Jed to be Captain as a reward for his leadership and bravery in the conflict with the Arikaras. Jed had proven his skill and trustworthiness. The new Captain led his men deeper into the Rockies in search of the wealth that the beaver pelts would bring to the company. Along the Cheyenne River, as the men were pushing their way through the thick brush, a huge Grizzly bear attacked the party. The Grizzly, the most ferocious and dangerous animal in the West, could break a horse’s back with one swipe of its giant paw. It was on Jed in an instant. The trappers watched in horror as their Captain fought the bear. Before Jed could fire his gun, the animal clawed him. It ripped open his side; breaking several ribs and then the bear’s huge jaws closed on his head. The Grizzly suddenly bolted back into the brush. The men gathered around their leader, sickened by the sight of blood that covered his body. Jed’s left ear dangled from his head. His scalp had been torn and his forehead gashed by the teeth of the bear. He fought to keep his wits about him. Then ordered the men to get water, clean his wounds and sew up the cuts on his head. The trappers also bound up his broken ribs and repaired his ear as best they could sew. Ten days later he was out checking his traps; his wounds had healed quickly, but he had terrible scars for the rest of his life. That winter Jedediah took his men into Wyoming, where they stayed with a friendly tribe of Crows. These Indians told the men that to the southwest there was a gap in the mountains that would allow them to cross easily. Jed knew that such a pass would make east-west travel much easier, especially by wagon. By February they were on their way to find it. The party went without food for several days because there were few animals to hunt in the deep snow. For over two weeks, their only water came from melting snow. Their southwest journey finally took them to a broad, level pass. Jed made a map and added notes so that he would be able to find it again. This discovery would be known to the history of the West as South Pass. It became the single most important factor in the transcontinental movement of the United States to the Pacific Coast. The gap served as the passage through the Rockies for the Oregon, California, and Mormon Trails. That spring Jed and his men trapped streams that no white man had seen, and made a huge catch of furs. In June Jed returned to the fort to report their discoveries to Ashley and to get fresh supplies. It was at this point in time that his career was to make another change. Ashley’s partner was quitting the business, and Jed was asked to take his place. Within a year Ashley also quit the business, and sold the company to Jed and two other men, named Sublette and Jackson. The new partners decided to split up the duties of running the company into three jobs. Jed was to search for new beaver streams in the West. In August of 1826 Jed led seventeen trappers on a trip that would last over two years. This trip would open California and Oregon to the trade and also to future American pioneers. The party left from rendezvous in Cache Valley, riding southwest into the valley of the Great Salt Lake, making their way south through deep canyons, towering peaks, and rushing streams and rivers. They crossed the Colorado River near the southern tip of what is now Nevada. Here they met a tribe of Mohave Indians and rested with them along the river several days. From these Indians they bought food, some horses and learned about the dry region, the Mohave Desert that lay westward of them. By the time they reached the mountain ridge on the border of this desert, the men were thirsty and blistered. On the other side of the ridge, however, was the San Bernardino Valley. They had been the first white men to travel from the United States to California overland! In 1826, California was part of Mexico, and that government did not want Americans entering their country over an overland route. The Mexicans were afraid that they would lose control if too many foreigners moved into the country. They did not have enough soldiers and money to keep the Mexican government in control. So Jed’s arrival was not a cause for celebration. The Mexican governor thought he was an American spy and told Jed that he had to leave the way he had come in and not to go north. Jedediah did not want to face the desert hardships again. He wanted to search for beaver streams to the north. Complying with the governor’s orders, Jed and his men left the way they entered but upon passing through the rage of mountains separating the two, the San Gabriel Mountains, he resumed his journey north along the backside of this range. At this period of time, most felt that Mexican California was a territory narrowly defined as “the settled belt along the coastal plain” therefore Jed felt free to proceed with his plans and proceeded up through and along the eastside of the Central Valley. Although winter came on, the weather in California was mild. They were able to trap as they moved northward. In the spring they had a good catch of fur and it was their desire to cross the Sierra Nevada Mountains and return to their rendezvous which was located east of the Great Salt Lake at Bear Lake. Realized the impossibility of doing this due to high peaks and heavy snows, they continue north. Upon reaching the vicinity of the present day capital of California, Sacramento, an attempt to cross the Sierra’s was implemented utilizing the American River but with disastrous results. Loosing horses and equipment and fearing for the life of his men, Jedediah returned to the valley floor and headed back to the Stanislaus River that he had previously visited. There he left most of his men in safe camp. Taking only two men, he headed east across the mountains towards the unknown lands across Nevada. The snow was still very deep and it was very cold. Some days they could move only two miles through the deep snow drifts. Upon crossing, they found more deserts but there was no choice. They now had to deal with the opposite type of weather conditions of hot and dry, traveling many miles over sandy hills with few plants and fewer waterholes. One hot, miserable day followed the next. For six hundred miles the men stumbled through the desert wasteland. They ran out of food, and grew weak from hunger, eating their horses as they fell and perished on the desert floor. One of the men gave up – too weak to go any farther. Jed and the other man struggled on another two miles. Finding water, they returned to revive their companion. They eventually came upon the Great Salt Lake and in early July, 1827, the three finally reached the camp and rendezvous site along the shore of the Bear Lake. After ten days rest, Jed began his return trip to California with eighteen men and the needed supplies. He decided to follow the original southern route, but upon reaching the Colorado River and the Mojave’s village, these Indians hid their true intentions of hostility and appeared to be friendly as before. Unbeknown to Jed, other trappers out of Taos (New Mexico) had previously visited this tribe, causing problems and killing tribal members and know these Indians were intent on revenge. After Jed and a few men reached the California side of the river, they realized that their companions had come under attack. Greatly outnumbered, the nine trappers were quickly clubbed or stabbed to death by the angry Mohave. The ten survivors gathered what supplies they could and headed west. Without horses or water and very little food it was again a struggle. Traveling at night, Jed could keep his men out of the killer sun and keep a watchful eye for any Indians that might be following. Ten tormenting days later they found themselves once again in the San Bernardino Valley. After resting, they headed north following again their previous route along the eastside of the Central Valley to the encampment of his men that had remained on the Stanislaus River. Since the supplies had been lost, Jed took a few men and headed to Mission San Jose to replenish some of those needed items. Upon his arrival, they were immediately imprisoned and Jed sent to Monterey where he was quickly arrested by the suspicious Mexican officials. The same Mexican Governor that Jed had dealed with in San Diego was now residing in Monterey and he again had to confront this indecisive government official. After much futile discourse over a three month period, masters of several vessels in port along with an American resident living in Monterey devised a plan that released the Governor of all responsibility. A bond was issued that guaranteed the good conduct and expedient departure of Jedediah and his men from Mexican territory. Selling is beaver pelts and purchasing supplies, horses and mules which he knew would sell quite well back at the upcoming rendezvous, Jedediah slipping away to the Great Central Valley in a northern direction towards the quickest way he knew would get him there. It was the Buenaventura (Sacramento) River he was heading for. All the current maps of that period showed that this river turned to the east above what is now the city of Sacramento, and headed right toward the Great Salt Lake. Driving his valuable horse and mule herd up the Buenaventura became quite difficult due to the spring snow melt that had flooded the valley. Reaching the north end of the (Sacramento) valley he realized that this river would not swing east and that it would be impossible to cross the high snowcapped mountains that blocked his way. On observing a gap in the mountains to his west, his only alternative was to head that way to the coast in hopes of traveling up it to the Columbia River back to the Rocky Mountains. With much difficulty and the loss of several horses and mules, they reach the Pacific Coast and began to move northward. The coast was rugged and wild, populated by friendly as well as unfriendly native peoples that were often warlike. Up the coast in southern Oregon, the party had an encounter with one of these warlike tribes near the Umpqua River. When a member of the Kelawatset Tribe walked off with an ax from the expedition, a mandatory tool that was necessary to cut their way through the thick coastal vegetation, he was apprehended and held until the item was returned. Several days later another incident with another member of this tribe, a chief, who mounted one of the trappers horses without permission and was affronted to dismount. The next day, while Jed and two men were off scouting the route north, the Indians, having sworn revenge for the insults inflicted on them, entered and destroyed the camp. Their raid killed all but one man who cheated death by his brute strength and fast running. The Indians took all of the horses, supplies and fur pelts. Separated, the four survivors struggled over one hundred fifty miles north to the British Hudson’s Bay Fur Company post at Fort Vancouver on the Columbia River, arriving one day apart from each other. The United States and Britain had agreed in 1818 that they would both occupy Oregon. The British were not hostile to the American fur traders. Even though they were competitors, they treated the Americans kindly and even agreed to return to the Umpqua River to try to recover the goods from the Indians. Hudson’s Bay people were able to recover only a small portion of the stolen supplies. In the spring Jed and only one of his men, the others desiring to stay, left the northwest and headed back to the Rocky Mountains. Since many there had given the party up for dead, the sudden appearance of the men was cause for great celebration. For the next year Jed worked the Bighorn Basin along the Wind River in Wyoming to the Musselshell River in Montana. It had been a successful trapping year. Jed decided that it was time to get out of the fur business. So in 1830 he and his two business partners sold their interest in the company to some of their trapping companions who had just formed the Rocky Mountain Fur Company and set out with loaded wagons with the furs taken that season for their final return to St. Louise. While in St. Louis his brothers joined him and wanted to start in the trapping and trading business. Jed discouraged them from entering into trapping, knowing the dangers and the declining market of beaver pelts. He encouraged them participate in the Santa Fe trade which his old partners were planning to enter. He help his brothers by setting them up in this new venture by adding several of his own wagons full of materials for trade to the already forming caravan and decided to go along with them to help. Around mid-April of 1831 the wagons departed for Santa Fe and by the middle of the following month they were in the middle of a dry stretch of sandy hills and desert called Cimarron Cutoff. It was a severely dry year and they had been without water for three scorching days. The animals were dying because of the lack of water. A last desperate effort was made to find water and men were sent out in various directions. Jed rode to the south toward the Cimarron River in search of water. That was the last that his brothers and friends ever saw of him. Later, his brothers discovered his rifle and pistols for sale in the streets of Santa Fe and Mexican traders told the tragic story of Jed’s death at the hands of Comanche Indians. While checking out a small water hole along the river, he was surrounded by unfriendly Indians who had secreted themselves in hopes of procuring buffalo that might come in for a drink. Spooking his horse, they were able to get off an injurious gun shot to Jed’s shoulder. Still mounted, he spun around and was able to get off several deadly shots, one of them to the chief, before they came in with their long spears and ended Jedediah Smith life. Jedediah Smith’s accomplishments during his short nine years in the fur trade and trapping business certainly earned him an uppermost rank as explorer in this period of United States history. 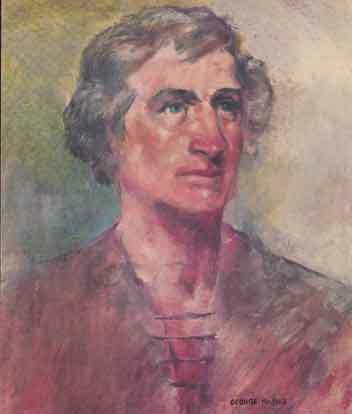 He led the first overland party from the east to California. He was the first to cross the Sierra Nevada Mountains going east. First to traverse the entire length of California overland, up through Oregon to the Columbia River. Discovered the South Pass from the east and was the first to bring to the public’s attention that wagons could easily utilize it to access the west which later encouraged the Oregon and California Trail wagons to follow his exploit. His travels were over twice the distance of Lewis and Clark and covered a broader territory. He had covered both a southern route and a central route to the west coast. Also from Great Salt Lake east to the Missouri River and from southern Colorado to northern Montana had been viewed by his eyes and journaled by his pen. While his maps and oral stories were shared with many people, unfortunately he did not live long enough to have his journals and maps published. I was using this website for a school project and it helped me a bunch!